【Long lifespan】 With a life of 15,000 hours, the bulb will last over 13 years ( based on 3 hours of use each day ). 【45 degree beam angle】 Narrow beam angle could be widely used as GU10 MR16 spotlight, track light or exhibition lighting. 【Easy to install】 Standard MR16 shape with GU10 twist and lock base fits well to replace all your regular MR16 halogen bulbs. 【Energy saving】 GU10 base LED bulb uses only 7W for 560LM of light. 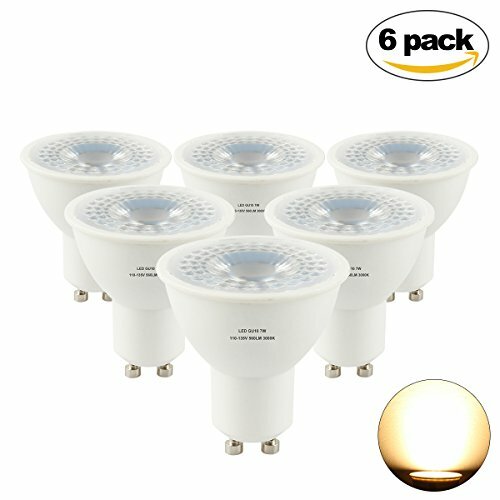 Replace 50W halogen MR16 bulb, save up to 90% electricity cost. 【Hassle-free warranty】3 Years Unlimited Warranty is offered, we have good after-sales service and we\'ll be in touch within 24 hours.